We offer custom wedding invitations, paper goods, as well as a collection of six semi-custom suites. If you are interested in requesting a quote for an upcoming wedding, please select from the options below. 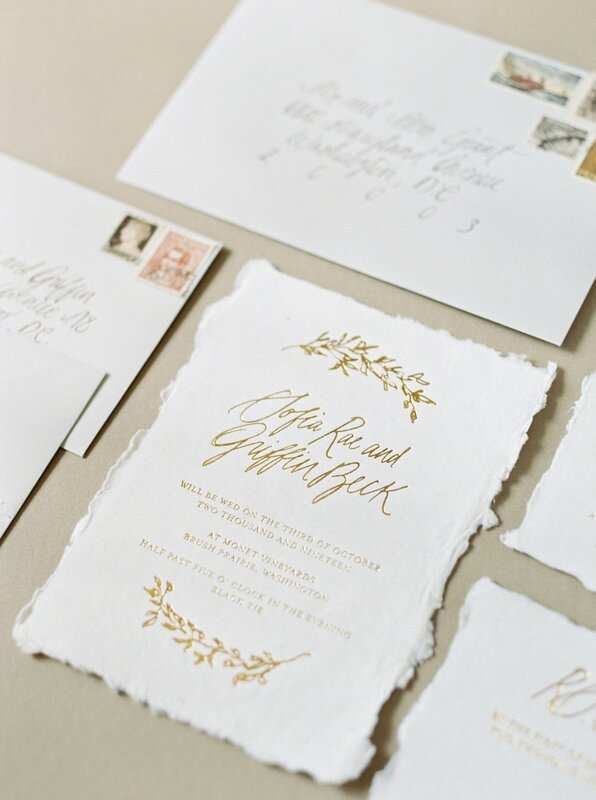 From handmade paper, letterpress, to gold foiling, we offer custom invitation suites for the modern day bride. Each custom invitation suite is unique to the bride, taking into consideration the overall aesthetic of the couple's wedding. Our custom invitation suites typically require at least 3 - 4 months to design and produce. Because we give all of our suites a lot of time and personal attention, requested delivery dates under 3 months from the time of deposit purchase, may be subject to rush order pricing. Final delivery date will be discussed and confirmed with the client before final proposal approval. Note: This is the number of invitations you wish to send, not the number of guests invited. Please send any inspiration images to hello@inkandpressco.com and/or include the link to your Pinterest board below. Do you have a budget for this project? This will help us suggest the best paper and printing options for your needs. Depending on the amount requested, on average our clients invest between $1,800 - $5,000 on their custom invitation suite. Knowing your address helps with shipping estimates and dates. Your personal information is never shared with third-party vendors. Thank you! We will email you soon with a quote for your proposed project. Shop our collection of six semi-custom suites, each inspired from our travels around the world. Semi-custom suites are designed for couples who desire an artisan touch at a more affordable investment than a completely custom design. Small details can have a big impact, which is why we offer additional day-of detail designs. From menu cards, ceremony programs to name cards, let us create your day of detail paper goods to add that finishing touch to your wedding. Our day-of detail paper goods typically require at least 6 - 8 weeks to design and produce. Because we give all of our paper goods a lot of time and personal attention, requested delivery dates under 6 weeks from the time of deposit purchase, may be subject to rush order pricing. Final delivery dates will be discussed and confirmed with the client before final proposal approval. Please select the paper you are interested in. We will recommend the best printing method for items requested, paper preferred, and quantity. Do you have a budget for this project? This will help us suggest the best paper and printing options for your needs. Depending on the amount requested, on average our clients invest between $750 - $2,500 on their day-of detail paper goods.